Every October, I get a few phone calls from friends and others who want some suggestions on what to give their boss for National Boss Day on October 16th. The first thing I tell them is to sit down and think about what their boss is interested in. Perhaps he or she loves art, sports, music or books. If someone tells me that his or her boss loves artwork from the Impressionist era, then I suggest looking for a Monet print at an art shop. Sometimes I tell my friends to think of the habits of their boss. For example, perhaps someone’s boss is always trying to find a clean place to put her purse while she is in the office. She doesn’t like to put her handbag on the ground and doesn’t want to take up space on a chair or on her desk. I suggest that this person make a purse clip for her boss’ desk. It’s both a practical AND a thoughtful gift on National Boss Day. The boss may even give her an extra thought around bonus time, but, of course, I offer no guarantees on that! Here are some gift ideas worth consideration. A Unique Umbrella-Your boss will be able to look at your thoughtful gift every time it rains! This is a practical umbrella with a fun twist. A Nespresso Machine-A boss who loves to have a little caffeine each day will love this machine. A gift like this is ideal for a boss you have been working with for several years or would be a good gift a group of people could chip in on as it is a bit pricier. A Hummingbird for His or Her Desk-Consider this hovering hummingbird gift for a boss who loves to have whimsical items in his or her office. 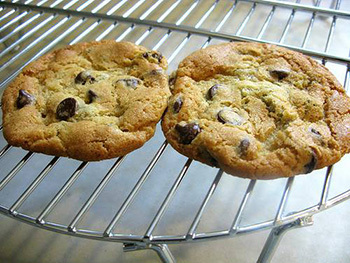 Chocolate Chip Cookies-Here is a delicious gift to offer the head man or woman in-charge. There are three recipes to create for a boss who has a weakness for chocolate or sweets in general. Be sure to find out if your boss has any allergies before choosing this project. A Tie for a Fabulous Boss-This is one of those gift ideas for a male boss who likes to laugh and look stylish all at the same time. Books about Wine-Peruse this selection of books in search of a gift suitable for a boss who is a wine connoisseur. Make a Purse Clip-This gift idea is perfect for a boss who doesn’t like putting her purse on the floor or on an empty chair. It is simple to make and she’ll likely use your gift everyday! A Piece of Wall Art-Select a piece of wall art by your boss’ favorite artist. You can make it even more special by getting it framed. Decorating a Flowerpot-If you have a boss who loves to keep plants and flowers in the office, decorate a simple flower pot to give to him or her in celebration of the day.